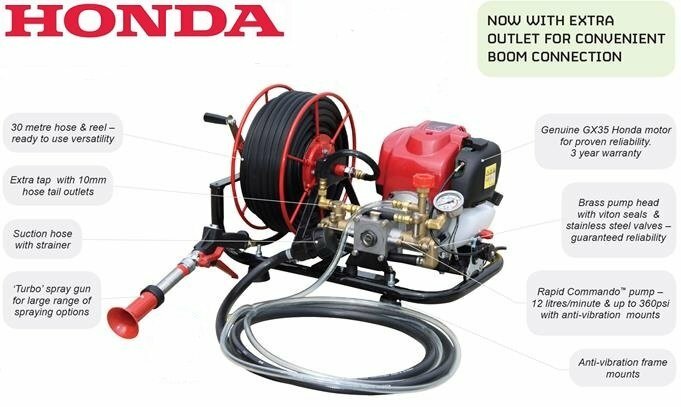 The Bushfire Store’s Spray Pumps range are high quality and extremely versatile spraying equipment. They are designed to perform and built to last. They can be used with fertilisers, pesticides, herbicides, fungicides and more. With a wide range of sizes, the Spray Pumps range is perfect for a variety of spraying units. ● USA Made Delavan 12 Volt Spray Pumps. ● Demand Style Pump with Adjustable Pressure Switch. ● Viton Valves & Santroprene Diaphragm. ● 2 Pin Electrical Connector. ● Supplied with FREE hose tail fittings. ● Filters, Regulators & Fittings Available. ● Full Replacement Parts Available. ● Full Warranty On All Spray Pumps. ● Reliable Spraying. ● Honda Motor with Commando or Bertolini Pumps. ● Suction Hose & Filter. ● Return Line. ● Spray Hose. ● Spray Gun. ● Pressure Regulator with Gauge. ● Italian Made Udor Zeta PTO Pump. ● 70 LPM, 20 Bar . ● 3 Diaphragms. ● 1 3/8″ Spline Shaft. ● Ultimate Reliability. ● Full Manufacturers Warranty. – Free Delivery is available on most Rapid Spray orders over $250. Click Here or contact us to find out if you are eligible for free delivery. DISCLAIMER: Images are indicative only. Quoted pump flow rates are open flow. Flow rates in real world applications will vary.